In which I relay essay scores. In which I complain I'm behind, and add to the delay by making a post. I've just got the final result for A(ZX)103, the Open University course which introduces us to the Humanities. The course contains introductions to music, philosophy, history, art, poetry and so forth. I found it tough in places - the humanities are not my natural inclination when it comes to academia. Given that, I'm pretty pleased with the result (though I keep comparing results with what I used to get when studying my 'natural' subjects - a mistake). I think I'm entitled to a little 'Yay'. For A103 my second to last OU essay has been marked, gaining 70%. Not too bad, and pretty much on a par with the rest of the marks. This means that my average for the course currently stands at a little under 70%, if I score zero in the final TMA (Tutor Marked Assignment) it'll be a touch under 60%. The final TMA carries a threshold mark of 30%, in other words, without that I fail the course. With the minimum mark to pass I'll get 63% overall, the best overall score I can hope for is 73.5%. The question now... where next? 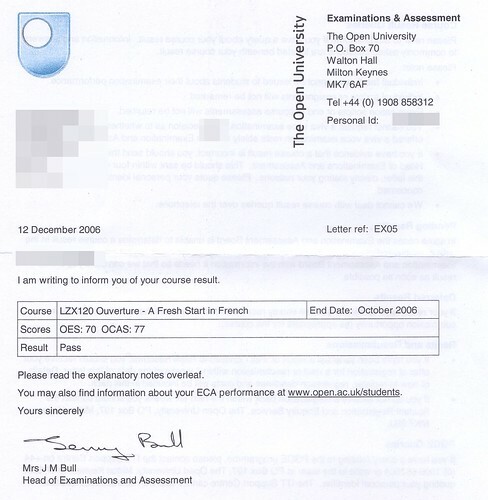 My first Open University certificate came through today. I'm now entitled to use the letters Cert French (Open) after my name. I won't be doing this, I don't even use my degree letters as a rule (BSc. Hons, I believe, though there may be some detail difference). To start using Cert French (Open) would be equivalent to writing my GCSE/O Level/A Level qualifications! Still, it's nice to have the bit of paper. The next one, assuming that I finish the course, will be Cert Hum (Open). No, I won't be using it, it may get silly. Article by Murk, BSc (Hons); Cert French (Open); PGCE; A levels in Maths, Further Maths, Computer Science, Physics; City of Guilds Amateur Radio Examination; RoSPA minibus training, GCSEs in English (Lang and Lit), Maths, Technical Drawing, Electronics, French, Geography, Chemistry and Physics; Bronze Duke of Edinburgh award, 6th Kyu Ni Judo (from 1981! ), yellow belt judo (similar vintage), cycling proficiency, 50m swimming; Milk Monitor. I have plenty of views on how science and religion link together, and so I posted the following (which was probably longer than the tutor had in mind) - and I was self censoring along the way to an extent. Both science and religion are attempting to discover a truth about the world. Both are seeking to understand not only what, but also why. In other religions, Science and religion have co-existed. For example, we use Arabic numerals - much of the knowledge of the west (including the ancient greeks) were preserved in Arabia through the dark ages. This is due to the pursuit of knowledge being prized in Islam. As Europe came from the dark ages, these materials were recovered (and translated back). In the same way, the concept of a place holder when writing numbers came from the east via Arabic scholars, (put a 1 in the tens column....) and this necessitated an empty place holder, which came from India - the zero. The Ancient Greeks found the concept of zero appalling! Interestingly, but irrelevantly, the Bengali symbol for 1 is a curvy version of the number we use. 2 is recognisable, and the Bengali symbol for 4 looks like our 8 - the Bengali 7 looks like our 9 - but the zero is the same - essentially our written numbers and Bengali written numbers share a common heritage - I'm afraid I don't know about the Hindi numbers. In India they tend to use western style numbers quite often though. In the west, we see links between science and religion most obviously when popular science uses religious language. Examples include Einstein's "God doesn't play dice with the Universe" (I don't think he was religious) or Dawkins' "River Out of Eden". Physicists are searching for the Unifying theory of everything (I can expand on that if you want), and Hawkins talks of knowing the 'Mind of God' (I'm pretty sure he's not religious). At the same time, religious leaders talk on scientific issues such as stem cell research, and talk of being 'under attack by secularism(**)' They talk of science going 'too far'. Worryingly, at a time when religion is becoming a divisive force in the world, our scientific knowledge is at the point that we could bring about an apocalypse (in the 'no more people' sense). Indeed, there are some right wing fundamentalists in the US who pray for such a final battle. here's one starting point - admittedly one unsympathetic to the idea of a final Armageddon! At a time when religion and science are being forced apart, it's ironic that science could provide people professing religious adherence the means to destroy us all(***). Science is a neutral, it can do great things - or not. Science is not moral, that's not to say it's IMmoral! The scientific method is a neutral, and be applied to any problem which admits the possibility of falsification, from saving us from global warming (to showing that global warming is the most probable explanation for observations), to the 'problem' of human destruction in warfare. Whilst science is neutral, how it's applied is not - and that is a matter of political will, which religion feeds into. (*) I'm using this in the scientific context, not the accurate but derogatory sense that creationists say 'evolution is just a theory'. ALL science is 'just' a theory, however, it's formed of theories that explain observed phenomenae and allow predictions to be made which are subject to testing. (**) In a nation where we demand that the deity save the monarch? (***) ... and if anyone really wants to know just how easy it would be to make something that would be really very nasty, then I don't think I want to tell you. Sufficed to say, it's scarily not hard - given the right tools and knowledge. The OU on TV is no more. What a shame. I used to love those programmes on a sunday morning (at least, I think that's when I saw them). Some guy discussing something quite complex. They took you through the topic assuming intelligence, but without assuming knowledge, and one could get a long way even as a casual viewer. Yes, they lacked cool - but so what? That wasn't the job! They were discussing something interesting, and you never knew what you were going to get. I used to like the mathematical ones with some model of a surface that had been constructed as a visual aid. Now the OU is moving to DVD, the transmissions have stopped. For a while the OU has (rightly) looked into wider programming, and slicker programming (debatable) and that means the programmes produced in the 70s have faded away - but these older programmes have some really good stuff in them. They're going to sit in an archive now and fester. I'd love to see them moved to DVD and made available for a modest sum (or ideally, made available in a format that can be downloaded and saved locally). A reasonable price point might be 10 to 15 quid for the programmes which supported a maths course, for example. Yes, they've got comic value in the dress sense of the presenters, but that's how people looked in the 70s! Once past that, and once used to the different style of delivery, they're fantastically rich sources of information. Some of the Physics programmes, whilst cheesy, are very good indeed. Unfortunately, modern productions often replace (instead of enhance) substance with glitz - and are poorer for it. I've received my mark back for TMA03 for my AZX103 course. I had to write about the Colosseum, and about modern stadia. I had to write about the perceptions of ancient writers to the games. I got 76%, which is a 'Pass 2', according to the mark descriptors a pass 2 is awarded for marks of 70-84%, and is given for a well-constructed, well argued and clearly written work, sustaining either relevant argument and/or relevant evidence, and showing intelligent grasp of the course materials. I'm reasonably pleased, but it's still not a Pass 1... but it's in the right direction. I've been working pretty solidly since I got home from work, as there is a deadline for AZX103 tomorrow, and due to various commitments I'd not got the essay completed before now. The essay is about the Colosseum, and the reactions that the ancient writers had to the games. It's been a big job, not many words, granted, but as it's a foreign discipline for me it's been quite tricky! I've got the work on a USB device, so hopefully I should be able to check it again before sending it in (I can do that electronically). I don't trust myself to send it in today as I'm now really tired and I need to read it with a clear head. I just hope it doesn't slip my mind tomorrow with everything that is to be happening! The next block of work (to be done by new year) is on the French revolution (Vive la Revolution! ), this is followed by two topics of greater interest to me, 'Art History and Philosophy' for the end of january and 'Religious Studies OR History of Science' for the start of march. I've had my first mark back for A103, it's 69%. The piece was in four sections, these were Art History (based on a dutch painting), music, poetry and philosophy. I'm not terribly thrilled with 69%; this is despite lots of nice comments from the tutor, how it's a discipline completely alien to me, how I've gone from novice to writing the essay in four weeks, and how she knows my technical knowledge (of the philosophy in particular) is actually better, but that I made a slight slip. I think the best I can really say is 'not massively disappointed'. My French course is done. My ECA was stumbled through, I think it was okay, but it's hard to be objective. If I pass the course, I shall be able to put 'Cert. French' after my name. I don't think I'll add that to any letterheads, I don't even use the BSc(hons)! It's time to look ahead. I did want to do European Studies, but that requires a level 2 language, and I don't want to do another language course with the Open University. A related set of courses is International Studies. Both of these are outside of my 'comfort zone', but that was the original point - increasing breadth of knowledge. To my eyes, some of the course descriptors seem rather woolly and ill-defined, topics like 'Are notions of "Britishness" and national identity, gender, class, race and ethnicity as relevant today as ever?' which could be argued back and forth in any variety of ways. My training is as a Physicist, and that involves being able to see the core of an issue - as a result the humanities can sometimes seem rather vague. I'm tempted to go off on a tangent and look at doing courses toward a degree in Computing or Mathematics. This would be much closer to my comfort zone, and would be directly relevant for work too... whilst I know that such topics would suit me well, and I'm sure I'd get a lot out of them, my original intention was to stick up two fingers at CP Snow's arts/science divide. It comes to this. Do I go out of my comfort zone or not? I.e. do I go for breadth (and possibly get a lower class of degree than I'd like as the humanities are not how my brain works), or do I go for depth in areas where I already have a higher than average competence? If I go out of my comfort zone, all I need to decide is which way to start, as a lot of the programmes have similar requirements in the early stages. I could go for a general introduction to the Humanities or an introduction to the social sciences. Within my comfort zone I'd start with either Using Mathematics (which looks quite straightforward to me, I've looked at some of the sample materials and it won't be any problem (i.e. no study required! - perhaps I should look at credit transfer?) or with Data, Computing and Information, which looks like it should broadly fall into the 'obvious' category with some newish things in there for interest. It's tempting to go for the humanities, as 'BA' combined with the existing 'BSc' would be rather nice - I might start adding the letters at that point! I honestly don't know what to do. I do know that for the next presentations I will need to make a decision in the next 24 hours.